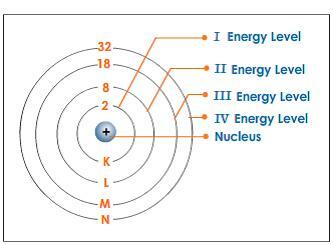 Electrons are arranged in shells at different distances around the nucleus. As we move across each row of the Periodic Table the proton number increases by one for each element. This means the number of electrons also increases by one for each element. Starting from the simplest element, hydrogen, and moving through the elements in order we can see how the electrons fill the shells. The the innermost shell (or lowest energy level) of electrons is filled first. This shell can contain a maximum of two electrons. Next, the second shell fills with electrons. This can hold a maximum of eight electrons. When this is filled, electrons go into the third shell, which also holds a maximum of eight electrons. Then the fourth shell begins to fill. Number of valence electrons influences the chemical properties of element by losing electron to form ionic bond or gaining electron to form covalent bond in order to attain noble gases electron arrangement. Thus, all elements having the same valence electrons will show the same chemical properties.